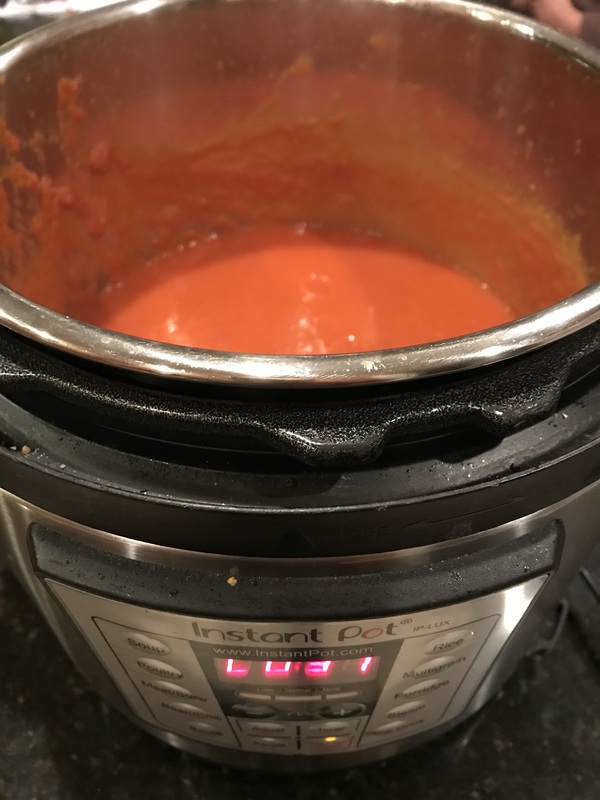 You can make soup and many other recipes in minutes if you own an Instant Pot(IP). My daughter loved it so much, she brought a smaller size of the same. I make everything in the IP. From sweet Pongal, toKhara pongee, to bisibele bath, and to soup, I use the IP for almost all of my cooking. I had a bag of frozen butternut squash, sweet potatoes and several boxes of frozen corn. I wanted to make something warm, not too spicy, and a dish with no onion or garlic. This soup was super delicious and very filling. Add frozen squash and corn and fry again. Now add cumin powder, grated ginger and mix well. This is the most healthiest Dosa you could ever eat. It is made up of Spinach, Ground Oats, Jowar flour and Chickpea flour or wheat flour. 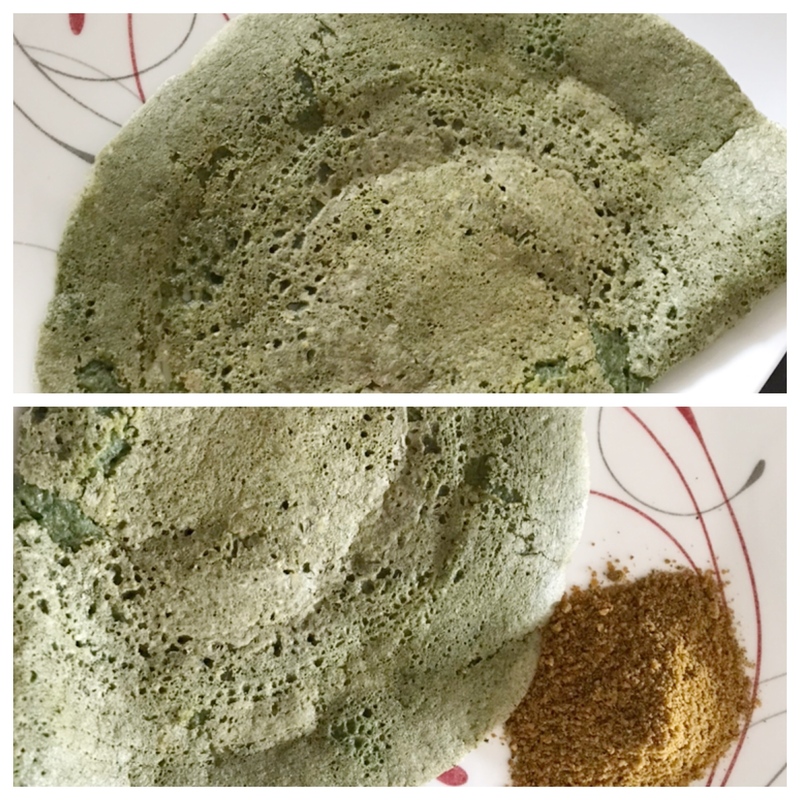 I have made the dosa once with Chickpea flour and once with Whole wheat flour. Both work well. Very simple, and loaded with lots of health benefits and perfect if you are dieting. Cook the spinach and let it cool. Put all the ingredients spinach, all flours. salt and green chillies in a blender and grind until smooth. Take out in a bowl, and add lira. Oil a pan and make Dosa. 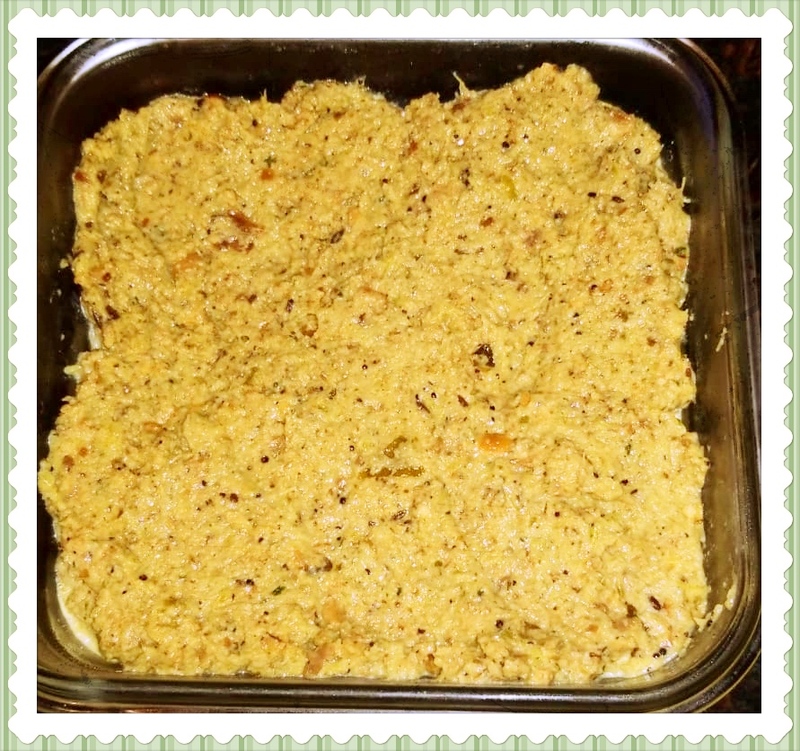 Serve with Chatni or Chatni Powder. Enjoy the most healthiest dosa. 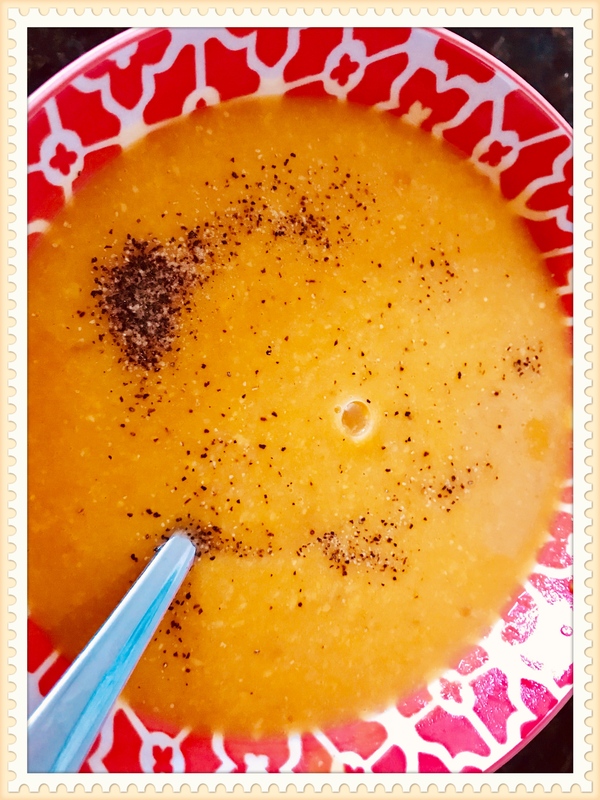 It is getting cold day by day, and the body and mind craves for something hot, spicy and yet healthy everyday. 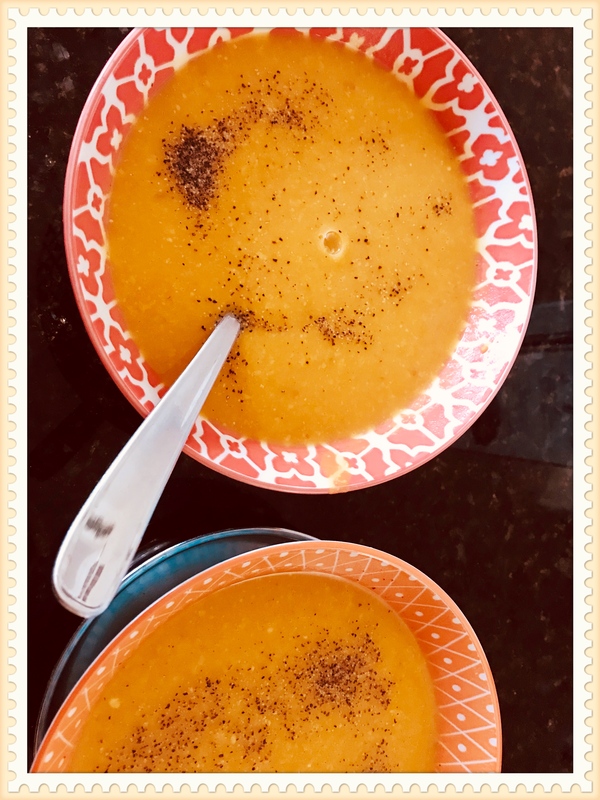 My daughter gave me the recipe for this yummy soup which is full of nutrients. I was given the Instant Pot(IP) by Ms. Vani (Extended Sister) and I have been using it religiously since. when onions turn translucent, add turmeric, coriander, cumin and red chili powder and fry. We are almost a dozen close knit satsangha group who have truly become sisters. We eagerly wait for the monthly satsangha, each one a staunch devotee of our beloved Rayaru. The very first attraction to all of us is our Rayaru, and the second the love and affection we have for each other, and last but not the least the food. In the month of August we had Satsangha at Ms. Radhika’s house. Ms. Padma prepared Celery Chutney and it was just delicious and something I had never eaten. My Sister used to make Majjige Huli from Celery, but I had never eaten Celery Chutney. It was very very delicious and immediately became a super hit. Yesterday, we had Satsangha at Ms. Vandhana’s house, and Padma once again made this chutney, and once again it was liked by one and all. 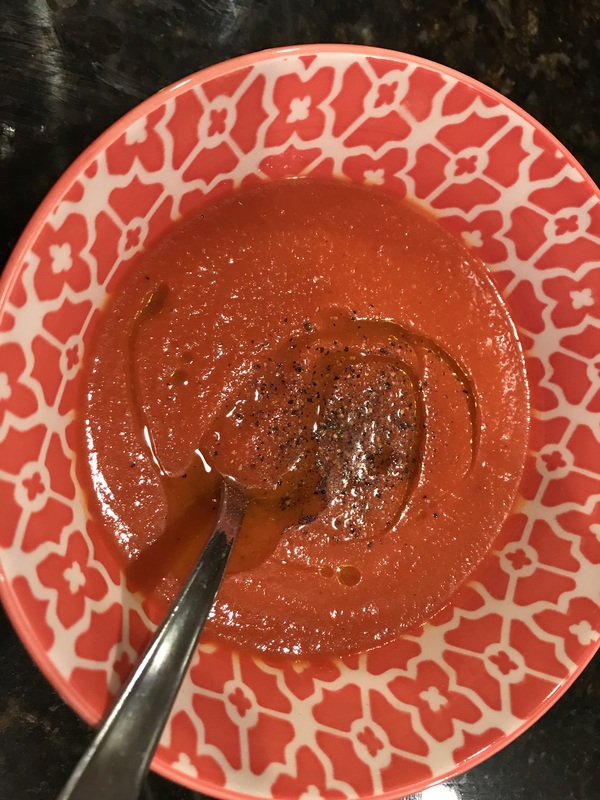 Everyone started asking the recipe, and the next thing I know they all wanted me to post it here so we can refer to it anytime we wanted. So, here comes the recipe for Celery Chutney. Thanks Padma, and Radhika. Recipe as sent by Ms. Padma on our WhatsApp group. Celery sticks – fresh medium size bundle (you can use the leaves also). Wash , chop into small pieces and keep aside. Use them fresh so that it has water content in it. 2 handful of peanuts and let it fry till light brown, move it to the side in the kadai itself and add 2 tea spoon of mustard seeds and let it splutter, add 2 tea spoon of jeera, 1 tea spoon of methi seeds and mix all the ingredients, add a small ball of tamarind and little hing and stir, add 4-6 green chillies based on how much spicy you want, add coarsely chopped ginger, curry leaves broken into pieces by hand and give it a stir, add chopped celery, stir and leave it open to cook on low to medium flame – do not close the vessel, it will anyways leave water. Add salt, jaggery and Coriander bunch and stir. It will leave more water. Let it cook for another 5 mins in low to medium heat. Blend either finely (for sandwiches) or coarsely for rice/ idly/dosa. Celery will still have water in it and most likely, you will not need to add water while blending. Shree Krishna Janmasthami this year is celebrated on Sunday September 2nd. I have posted several posts for many years now, and this one has all the links for easy access to you all. Hope you all have a wonderful celebrations and get the blessings from our Lord Krishna. Click on the links below to get all information. May Lord Krishna bless us all. My granny used to say whatever we do should be to the good of the world. I will be very happy if more and more people make use of it and remember her. Even beginners can cook from her book. I am truly truly humbled and blessed to see Ms. Nanda share this cook book with me and to share it with you all my extended family. I went through a couple of recipes, it is just awesome. A truly great treasure from a grandmother to her family and to us all. Again, the cook book is in Kannada, if you know Kannada download the same. Ms. Nanda has mentioned they are working on an English translation. Download the same and enjoy delicious, Madhwa recipes. Thanks Nanda and our namaskaras to your Ajji. She will be remembered forever through this blog and the cookbook. Hope to meet you soon, Nanda. I was supposed to post this Payasa recipe as soon as I finished the Satsangha I hosted in May. Like I say many times” Man/Woman proposes God disposes”. As I was going through the Satsangha pictures today, I saw the pictures I had taken of the Payasa so I could post here. Also, remember this Payasa is a favorite of our Beloved Rayaru. During the Satsangha, this payasa was a super hit and everyone had 2-3 servings. It was creamy, crunchy with the poori, with the right balance of sugar and lots of nuts as well. So, here comes the recipe. Super easy, and super tasty. Sieve rava, maida with salt. Make sure it is super fine. I ground mine in mixie since it was not super fine. Mix ghee and make a stiff dough. Just like you do for chapathi. Let the dough rest for 1-2 hours. Take small balls and make super thin pooris. I made some slits with a knife so they don’t puff up. Fry in oil or ghee. I used oil. Make sure they don’t puff up. Make thin pooris so they are crunchy. Take milk in a heavy pan and boil. Keep stirring. You can also use condensed milk, it is however optional. When it becomes thick or reduces to half, add sugar and keep boiling. When this becomes quite thick add saffron soaked in milk. Fry nuts in ghee and add to the milk. When ready to serve, crush the pooris and add to the payasa. You can serve hot or cold.